When the Baseball Commissioner’s Office went searching for a precedent in the John Rocker case of 2000, they came up empty. It took a call from former Yankee public relations director and television producer Marty Appel to call their attention to the 1938 matter involving a forgotten Yankee outfielder – Jake Powell – and a suspension over racial remarks on the radio. Appel, an “accidental Yankee fan” (“I was born in Brooklyn!”), has been cited by the New York Times as one of the nation’s premier authorities on Yankee history, and is generally acknowledged as one of baseball’s most informed historians. Indeed, a private library of more than 2000 baseball volumes is one of the largest private collections in the country. But Appel’s curiosity has cultivated his knowledge far beyond the written word. As a Yankee employee from 1968-1977, and as their television producer in the ‘80s and ‘90s, he never missed an opportunity to get to know the elders of Yankee lore – be they Lefty Gomez, Bill Dickey, Red Ruffing, Bob Shawkey, or Waite Hoyt from long ago – or his boyhood heroes like Whitey Ford, Bobby Richardson, and Elston Howard to his contemporaries like Catfish Hunter, Graig Nettles, Thurman Munson, Lou Piniella and Willie Randolph. And of course, there were the ones everyone wants to know more about – Joe DiMaggio, Mickey Mantle, Reggie Jackson, Yogi Berra, Phil Rizzuto, Billy Martin, Casey Stengel, and yes, the Voice of the Yankees, Mel Allen. Appel, award-winning author of 16 books on baseball and countless magazine articles for Sport, Baseball Digest, Beckett, Sports Collectors Digest, and others, knows the story of the Tammany Hall-connected Yankee beginnings at the turn of the 20th century; the building of Yankee Stadium, the nation’s first triple-decked ballpark – the rise of fall of the Yankee empire, the CBS years, and the media frenzy over the George Steinbrenner era, complete with hirings, firings, suspensions, ticker tape parades, and a question of a “new” Yankee Stadium. Appel, for 21 years a collaborator on the plaques that hang in Cooperstown, was also co-author of books with Thurman Munson, Lee MacPhail, Bowie Kuhn and Tom Seaver. Through his public relations company, he handles Yogi Berra and the Yogi Berra Museum, as well as Topps, Leland’s Auctions, The Sporting News and other Yankee-related accounts. And his book, Now Pitching for the Yankees, an autobiographical tale of his Yankee adventures, was named the best New York baseball book of 2001 by ESPN. His book, MUNSON: The Life and Death of a Yankee Captain was a 2009 New York Times best-seller, and PINSTRIPE EMPIRE: The New York Yankees from Before the Babe to After the Boss is considered the definitive history of the franchise, with a children’s version, PINSTRIPE PRIDE published February 17, 2015, is now in paperback. Marty’s latest book, Casey Stengel: Baseball’s Greatest Character was published on March 28, 2017 to critical acclaim is now available in hardcover, Kindle and audiobook at Amazon.com. Marty Appel Public Relations was incorporated in the State of New York in March 1998, but the foundation for the company goes back to 1968, when Appel joined the public relations staff of the New York Yankees. With over 30 years of contacts and skills, the company today serves a range of clients, largely in the world of sports but also in publishing, education. consumer products, medicine, and not-for-profit. As a major boutique agency based in the communications capital of the world, Marty Appel Public Relations affords clients the benefit of experience, attentive service, and hands-on management from one of the nation’s best known practitioners of the art of communications. Appel, for over two decades a collaborator on the plaques that hang in Cooperstown, was also co-author of books with Thurman Munson, Lee MacPhail, Bowie Kuhn and Tom Seaver. 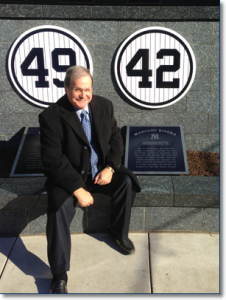 Through his public relations company, he handles Yogi Berra and the Yogi Berra Museum, as well as Topps, Leland’s Auctions, The Sporting News and other Yankee-related accounts.